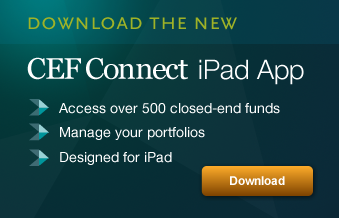 CEFConnect provides unbiased, straightforward, and comprehensive closed-end fund information. By providing the latest closed-end fund data, you can screen, sort, and explore the latest CEF research, news, and videos. Learn about closed-end funds, how to use closed-end funds to build a portfolio, and more—all for free. Become a Member for Free Portfolio Tools! Join CEF Connect and get tools to track your funds, set automated alerts, read news updates, and more. All at no cost. Volatility Periods of volatility in the stock market are not uncommon and may present opportunities to closed-end fund investors, says Maury Fertig of Relative Value Partners. Challenge Maintaining the connection between investors and their advisors presents a key financial challenge, says Sean Walters of the Investments & Wealth Institute. Income Income seekers may want to consider a range of investment products, including closed-end funds, says Mitchell Goldfeld of RPg Family Wealth Advisory.